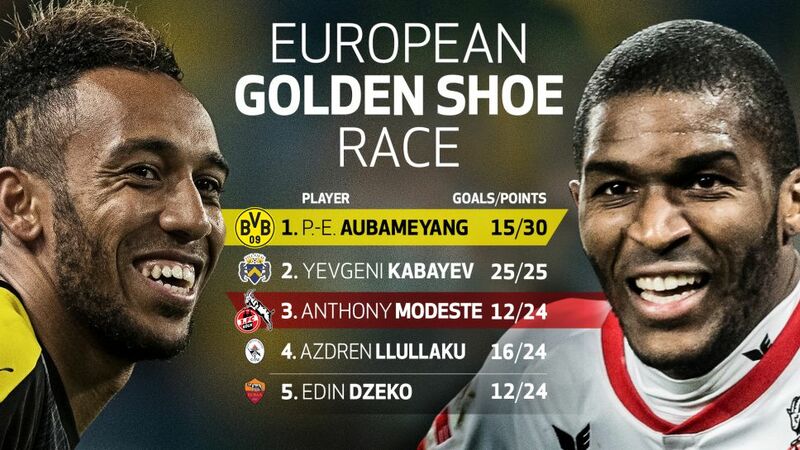 Right now Pierre-Emerick Aubameyang and Anthony Modeste are two of the most lethal strikers in Europe. The Bundesliga is known for excitement, up-tempo matches and plenty of goalmouth action - and this season, it also features the striker leading the charge in the European Golden Shoe stakes. Add the Bundesliga's prolific strikers to your Official Fantasy Bundesliga team now! The European Golden Shoe, formerly the Golden Boot, is presented to the top goalscorer in all European leagues and Borussia Dortmund's Pierre-Emerick Aubameyang currently tops the charts having scored 15 goals in 13 games. With the Bundesliga being one of five league's to boast a two-factor multiplier, Anthony Modeste of 1. FC Köln, who has already netted 12 times this season, also features in the top three. Aubameyang has been in red-hot form of late notching up eight goals in his last five games in Germany's top-flight and, this season, is yet to go consecutive matches without getting his name on the score sheet. The 27-year-old has scored in all but five of the Schwarz-Gelben's 14 matches this season and would become the first Bundesliga player since FC Bayern München's Gerd Müller in the 1971/72 campaign. If Aubameyang keeps scoring at his current rate, he could conceivably finish the season with 40 goals to his name, which incidentally was the tally Müller racked up to claim the award 46 years ago. Watch: Aubameyang's latest goals in Dortmund's victory over Gladbach. Modeste's goals have played a big part in Köln flying high in the current campaign with the Billy Goats having occupied a top-six spot for 12 of the opening 14 Matchdays. The Frenchman has notched a full two-thirds of the Billy Goats' goals, while his goalscoring form has inspired a social media campaign for his inclusion in the French national team: #Modeste2018. The 28-year-old is currently in the midst of a three-game goal drought, but will be hoping to put that to an end when 1. FC Köln take on SV Werder Bremen on Matchday 15. Head here for more Borussia Dortmund club news! Head here for more 1. FC Köln club news!